I had a really hard time thinking of a suitable name for this cheesy, delicious tortilla concoction. I finally settled up on Crock Pot Cheesy Salsa Verde Chicken Chimichangas - say that five times fast! The name, however, doesn't begin to describe the deliciousness - or the simplicity. The week before last I promised new recipes, but exhaustion has gotten the best of me. Between growing a tiny human, the heat, a particularly hectic time at work, and a little travel mixed in, I have just been so tired! Fortunately said tiredness led me to do some crock pot experimentation and I have to tell you, this recipe will become part of my regular rotation. I started by simmering chicken breasts with onions, salsa verde, spices, and a little chicken stock. When I got home from work I shredded it up and stirred in fresh spinach (get those greens guys), cream cheese, and just a touch more salsa verde. But why stop there? I rolled it up in a tortilla with a little cheddar cheese (for good measure) and browned it up into a lightened up version of a chimichanga. Or should I call it a crispy burrito? We'll stick with chimichanga. This chicken would also be great in a quesadilla. In the crock pot, combine chicken, onion, salsa verde, garlic, cumin, salt, and chicken stock. Cook on low for 8 hours, then shred with two forks. Add in cream cheese and spinach, and 2-3t tbsp. more salsa verde if the mixture looks dry. Cover and continue to cook for 15 minutes, or until cream cheese is easily stirred in. Stir well to combine. Heat a nonstick skillet over medium high. 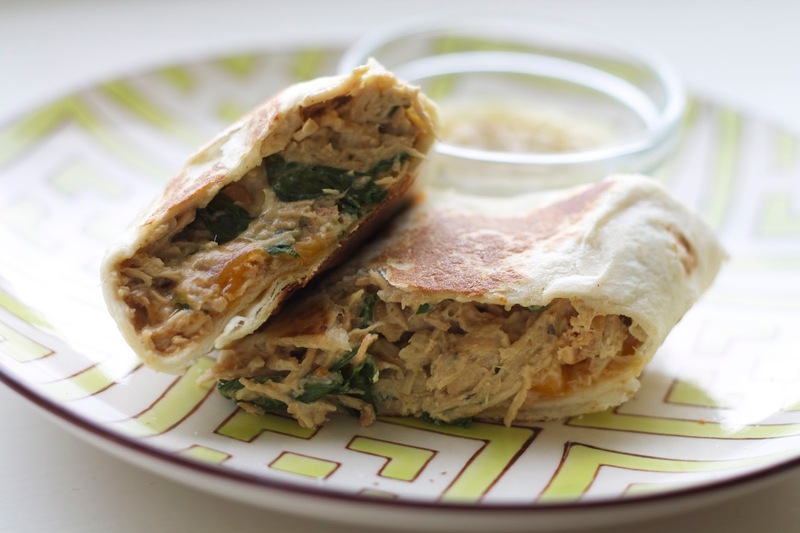 Lay out a flour tortilla on a work surface and scoop about a quarter cup of the chicken mixture into the center. Top with about a tablespoon of cheddar cheese. Fold in the sides of the tortilla, then roll it. Spray entire outside with cooking spray, then lay it seam side down in the pan. Brown on all sides. Serve with sour cream and more salsa verde. Enjoy!